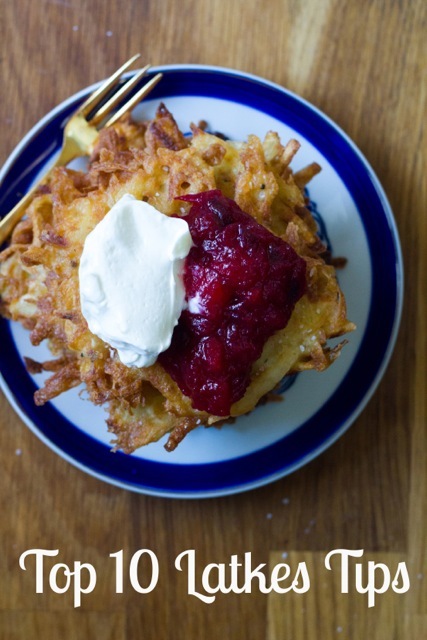 My top 10 tips for the crispiest, best latkes ever! On the surface, potato latkes are a simple dish. Potatoes, onions, eggs, flour or matzo meal. A little salt and pepper. Fry. What could go wrong? Turns out, plenty. Latkes can be limp, underseasoned, undercooked or burnt and sometimes they’re all of these unfortunate things. Blech. What kind of pan should you use? Can you make them ahead of time? What about oil type? Help! Hanukkah should be a joyous time. Eight days of gorging yourself on fried foods, pyromania and, of course, presents. But throw in some sub-par latkes, and you might start to feel like a dreidel player who’s hitting shin, over and over again. Like a loser. But I want you to have latke success! 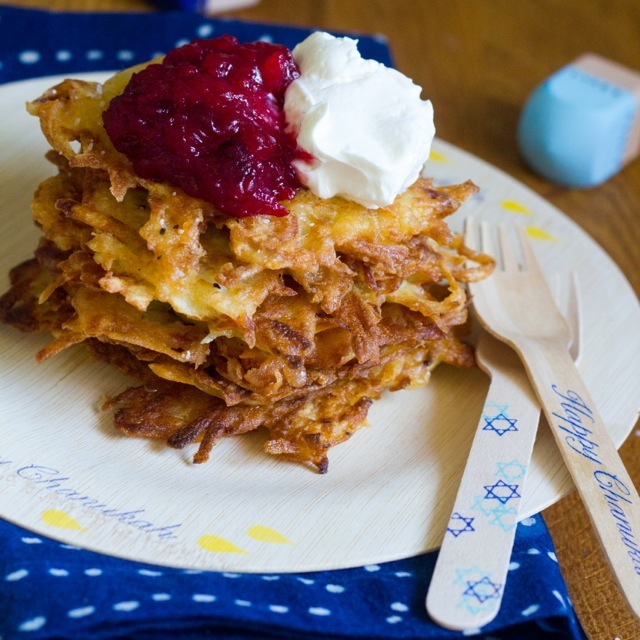 Get all my Latke and Hanukkah recipes here! What kind of potato? The starchier the potato, the crispier the latke. Makes sense. And the starchiest potato out there is the unassuming russet. They’re usually pretty cheap too, which means more latkes! 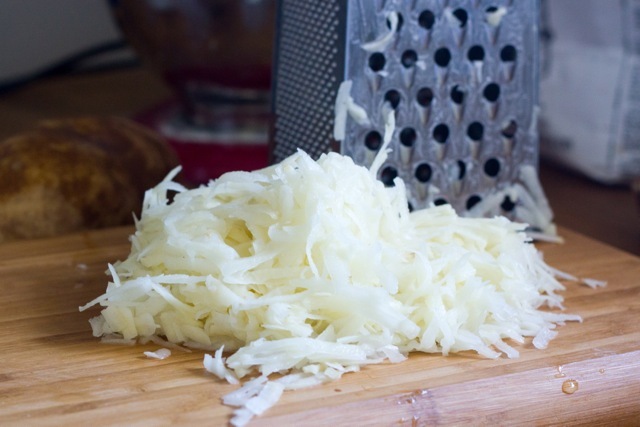 Hand grate or food processor? I like to hand grate my latkes. Because that’s how my Bubbe did it and if it’s good enough for Bubbe it’s good enough for me. Maybe it’s the blood, sweat and arm power you have to put into hand grated latkes, but they just taste better that way. Save the starch! Shred your potatoes into cold water to prevent browning. Then wait about 10 minutes, set aside a sieve over a bowl and drain the water into the new bowl leaving the potatoes in the sieve. Press out excess water from the potatoes. Let the starch in the reserved water settle, then carefully drain the water, reserving the milky white stuff on the bottom. That’s the starch! Add it back to your dried potatoes for extra crispiness. When making sweet potato latkes, I add cornstarch to the water to up the starchiness and crispiness. Dry baby, dry! After you take the potatoes out of the water, remove as much moisture as possible using towels. Again, less moisture means crispier latkes, which means better latkes. Are you seeing the pattern here? As the later batter sits, it tends to get watery again. So make sure to dry again! Seasonings. 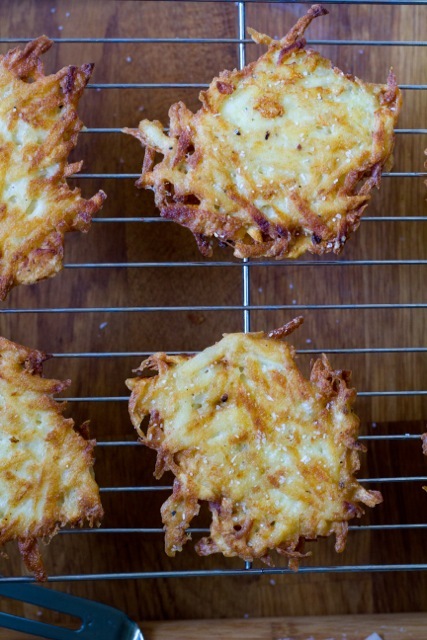 Feel free to get creative with your latkes! Add cumin, cayenne, za’atar, cinnamon and don’t forget the salt. What about toppings? Sour cream and applesauce are delish, but how about a horseradish cream, or guacamole for a change? Fry, baby, fry! 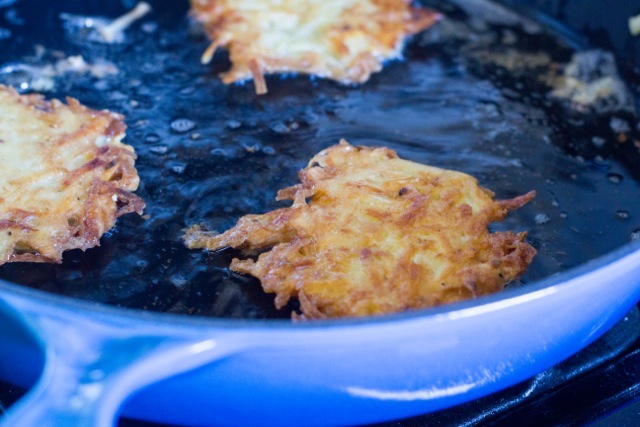 Use an oil with a high smoke point to achieve perfectly golden latkes. I prefer grapeseed or canola oil. How do you know if it’s hot? If you test a bit of the latke batter in the oil, it will sizzle but not brown immediately. Check oil periodically while frying to make sure it doesn’t get too hot or cool. Three’s a crowd. Don’t crowd the pan! Too many latkes cool down the oil, making soggy latkes. Let the edges of the latkes get nice and brown before flipping so they won’t stick. And resist the urge to use a nonstick pan: you want the potatoes to caramelize to get that nice golden color. Salt! Fried food tastes good with salt. It’s just science. Blot latkes on paper towels and drain on a draining rack. Salt latkes immediately after you take them off the fryer. Having a crowd? Set the oven to 250 degrees F to keep latkes warm while you are cooking the others. But don’t let the batter sit too long or it will brown. Make ahead. You can do this! Fry per usual, and then freeze them on a cookie sheet and pack in a freezer safe resealable bag. When ready to serve, let latkes thaw slightly and reheat in a 375 degree F oven. My basic latke recipe! Feel free to get meshugena. I usually don't even measure this recipe. You want just enough flour and eggs to hold together the potatoes. Start by shredding your potatoes with a grater into a bowl of ice water. Let sit for 10 minutes. Remove potatoes, squeezing out the moisture into the water. Dry potatoes very well with towels. Let sit 10 minutes for starch to accumulate on the bottom. Carefully drain water, reserving the white starch on the bottom. This part is optional, but helps make crispier latkes with soft insides. You can also add potato starch. Place potatoes in a large bowl, dry again very well. Then add in the onion, eggs, flour and salt and reserved starch and combine. Set up a cooling rack over paper towels. Meanwhile, heat up canola oil in a large saute pan. A dab of schmaltz never hurt either. Scoop heaping spoonfuls of the potato mixture and flatten slightly and fry until golden brown, about 3 minutes. Then flip and fry the other side. Sprinkle with more salt and drain on a rack over paper towels. Eat! Happy Hanukkah to you, Amy! I want to use only matzah meal. Would I use 3 tablespoons with your recipe? Thanks! Sure! I love how matzah meal helps with the crunch factor too. If you go to a recipe, they are printable! This page doesn’t have a recipe. I don’t think that’s really necessary since the starch sticks to the bottom and it’s easy to drain the water off the top just by pouring it! Hi Amy, I will making latkas for a party and will have a guest who has Celiac disease. Should I use 3 Tbs. of potato starch for the flour/matzo meal or something else? Love your site. Thanks for your help. Hag Sameach! Aw thanks! That should work, I haven’t tried it but sometimes I don’t use flour at all and they still come out good!